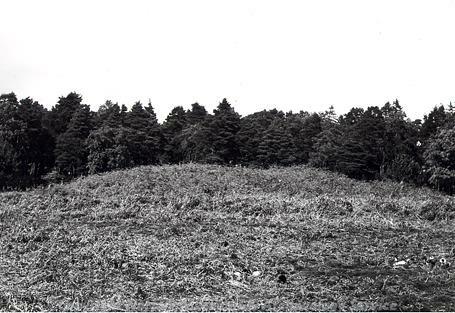 A bell barrow, the largest of a group of Bronze Age round barrows in the area, about 30m in diameter and standing just over 2m high with surrounding banks and a ditch. It is covered in bracken and has been much eroded by rabbits and tree roots. Bell barrow (The Great Barrow of the group). Weasenham Lyngs Grinsell's No. 5, recorded by him as 43m (140 feet) in diameter and 2.1m (7 feet) high. Dr Puddy in 1935 recorded it as ditched with inner and outer banks, the outer 60cm (2 feet) high and inner 30cm (1 foot), barrow 2.1m (7 feet) high. From far perimeter to further side of barrow was forty four paces, to further inner bank fifty paces, to ditch fifty two paces, to far side ditch fifty six paces, to opposite perimeter sixty paces. He also recorded that there was a 'squatter's hut on east side' and a slight hollow on top, bracken covered. 'Hut' is semicircular depression. 4.6m (15 feet) in diameter with bank 60cm (2 feet) wide. Pit about 1m deep dug in centre of top by unknown person. Reported by owners (Weasenham Charity Lands) to NAU. Visited by A.J. Lawson who found no finds, it exposed podsol. To be backfilled by farmer. Outer bank 3.5m wide, 60cm high, ditch 3m wide. 60cm deep, inner bank 2m wide, 30cm deep, berm 5m wide, mound 30m in diameter, 2.2m high. Depression in centre; bracken covered. A. J. Lawson (NAU), March 1975. Covered in bracken and scrubby elder. Old post and wire fence on top of outer bank. In poor condition suffering from eroded elder roots. Plough cutting into outer bank. H. Paterson (NAU), February 1991.
perimeter bank and also on summit of barrow. Undergrowth to be cut within next few weeks. Owner has 'pelleted' rabbits but problem will be investigated and any further infestation dealt with. H. Paterson (NLA), 8 July 1994. Visited to check effectiveness of Section 17 Agreement. Grass cover continues to increase. Rabbit disturbance once again re-colonizing. Infestation worse than on previous visit. H. Paterson (NLA), 17 March 1995. Rabbit fencing breached by undermining in area 30m in clockwise direction from stile. One burrow on summit. Much bracken cover. Further infestation on summit and either side of stile on outer bank, noted on subsequent visit. Contractor to deal with this. H. Paterson (NLA), 26 February 1996. Several breaches in fence by rabbits. Much bracken cover. One fence post knocked askew. Contractor to visit and start work soon as agreed in Section 17 grant. H. Paterson (NLA), 5 October 1999. 30 August 2000. Visit. AM Number: 164. Bracken and rosebay willow herb head high over site. Rabbit instrusion appears less. Peter Loosley (Contractor) telephoned to say bracken will be cut in the near future. Spraying is impossible due to height of bracken. H. Paterson (A&E), 30 August 2000. Barrow under dead bracken and other annual weed. Due to the wet summer, bracken height rendered control by Azulox dangerous. Bracken will be cut when growth halts, followed by spraying. Ragwort will be pulled or spot treated and rabbits controlled. A replacement Section 17 agreement will be implemented to accommodate extra management requirements. H. Paterson (A&E), 2 February 2001. Details, photographss, plans and correspondence in file. Banks and mound of the bell barrow can be seen clearly on aerial photographs. S. Massey (NLA), 26 May 2001. Section 17 Management Agreement signed 19 March 1999 (5 years). H. Paterson (A&E), 14 September 1999. Damage has been caused to the enclosing post and wire and rabbit fencing. Twelve posts either loose or fallen, wire broken, mesh crumpled, stile broken. Secretary of Trustees written to asking that damaged fencing be reinstated. Minor rabbit infestation at present. H. Paterson (A&E), 30 May 2002. Annual strimming completed. No rabbit disturbance observed, although rabbit fencing collapsed for several metres. Possibility of Stewardship to be discussed at end of Section 17 Agreement. Article missing from file [J. Yates, 12 November 2010]. --- Aerial Photograph: TF8519 A-H,J-M,R-S,T,U. --- Aerial Photograph: Edwards, D.A. (NLA). 1996. TF8519/V - Y. --- Archive: Clarke, R. R. and NCM Staff. 1933-1973. Norwich Castle Museum Record Card - Bronze Age. Weasenham (all saints). --- Photograph: BZP 3, BZE 1. <S1> Article in serial: Clarke, W. G. 1913. Norfolk Barrows. The Antiquary. Vol XLIX pp 416-423. p 423. <S2> Monograph: Grinsell, L.V.. 1936. Ancient Burial Mounds of England.. p 185. <S3> Monograph: Grinsell, L.V.. 1953. Ancient Burial Mounds of England.. pp 199, 203. <S4> Monograph: East Anglian Archaeology. East Anglian Archaeology. Vol XII. <S5> Newspaper Article: Eastern Daily Press. 1941. 14 May. <S7> Scheduling record: Corbishley, M.. 1983. AM107.